Try this healthy breakfast idea (that is also an easy meal to make) next time you bring beets with their greens from the market. 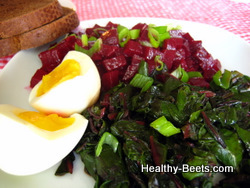 What's good about it that you can prepare beets and greens a day before - they will easily hold for a day in the refrigerator - and, then, assemble a quick meal next morning adding soft-boiled eggs and breads. Sprinkle your favorite cheese or pine nuts on top of greens, or serve it with grains (quinoa is my favorite ) for a more substantial and healthy breakfast. Try it - it's delicious! Use this recipe as a guideline. If you follow instructions and bake the beets, it will give you the best tasting beets. But, if for any reason you don't want to use your oven, cook the beets at your convenience: in microwave, or by boiling or steaming. Blanch or steam beet greens, if preparing in advance, and then sauté them for a few minutes before assembling your breakfast plate. Or, simply sauté just washed and chopped beet leaves with a little water added to the pan for 8-10 minutes until soft. Preparation time: 20 min, plus time to cook beets. Separate the leaves and stems from beets. Wash the beets gently and wrap each one in aluminum foil. Bake for 35 min to 1 hour. Cool, peel and cut the beets into small dice. Prepare the vinaigrette combining the mustard, honey, oil and vinegar. Mix the diced beets and vinaigrette and set aside. Separate the green leaves from beetroot stems. Discard the the stems, or leave them for another use. Wash the beet greens thoroughly and steam for about ten minutes. Drain to remove excess water. Cook eggs in a pan of boiling water for 5 minutes. Carefully remove the eggs, dip them in cold water and peel. Sauté beet greens for a few minutes with a little oil (optional), and arrange the beets, beet greens, and eggs on the plate. Sprinkle a little onion on top of the diced beets.